Businessman R. Dhinakaran is tired of seeing customers leave health supplement chain Holland & Barrett empty-handed after waiting too long to be served. "Customers expect great service, but local manpower is hard to come by," said the managing director of Jay Gee Melwani Group, which operates the chain and distributes fashion brands such as Levi's. 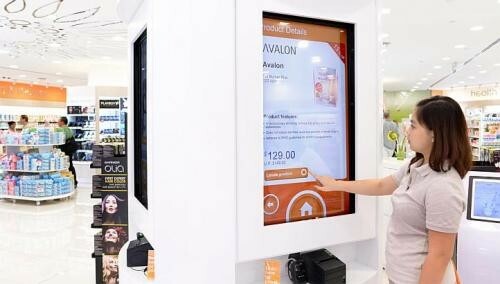 To counter this, the company is investing about $250,000 to place touchscreen kiosks at its 25 Holland & Barrett outlets, offering customers information on supplements. This could reduce the need for one staff member at each of its bigger outlets. And every bit counts. To combat the manpower squeeze, retailers here are looking long term and embracing technology, beyond adopting stop-gap measures like hiring part-timers during the festive shopping season. Six in 10 expect to increase spending on technology in the next year, according to the A*Star Technology Adoption Programme retail survey conducted last month. "Technology is one of the main drivers of productivity which would enable retailers to transform their business processes, while alleviating the manpower crunch," said Ms Megan Ong, deputy director of the Singapore Institute of Retail Studies, which conducted the survey. Shoe label Charles & Keith, for example, is looking into the feasibility of two information technology solutions at its stores: radio frequency identification tags and hand-held devices for sales staff. The first would allow cashiers to scan items much faster and in bulk; the second would let staff check stock availability without having to run to the storeroom. "Rather than going in, searching, coming out and saying 'sorry, no size', you can instead spend more time with the customer," said Mr Fong Shee Beng, executive director of Charles & Keith International. This can improve the shopping experience and productivity on the sales floor, he added. Other companies are also turning to interactive technology to better serve customers. For instance, the newly opened Guardian Plus store in Takashimaya, which is run by Dairy Farm, is equipped with touchscreens and tablets to help patrons locate products and find out more about promotions. Do-it-yourself chain Home-Fix also uses interactive television sets and video displays to provide product information, reducing the reliance on sales assistants. These firms are ahead of the curve. At a biennial meeting of the National Trades Union Congress last month, Deputy Prime Minister Tharman Shanmugaratnam highlighted the retail industry as a sector which needs to move up the productivity ladder and grow. He said that the Government is helping retailers to develop online stores to tap the local and overseas markets. While some retailers agree this is a feasible approach to supporting brick-and-mortar shops, they worry about losing their personal connection with customers. "We don't want our customers to simply transact with us," said Mr Ian Lim, chief executive of FJ Benjamin (Singapore). "We want to build meaningful relationships and provide an experience that will be remembered." Other long- term solutions which companies say they may consider are having shorter opening hours and hiring more part-time workers. But most are aware that embracing a greater use of technology is the most reliable way forward. Holland & Barrett, for instance, hopes to introduce the kiosks in the middle of next year. "Hopefully, when we have more time to engage our customers, we will not lose them any more," said Mr Dhinakaran.